Automobile enthusiasts are not all alike. Of course, they love cars and motorcycles, but a taxonomy of the species will reveal certain distinct traits. We are not talking of men with allegiances to a particular brand, or type of car. The subgenus we are referring to is of the kind that is obsessed with a particular type of car made by a particular manufacturer. Our friend and automobile journalist Rohin Nagrani is one of them. Nagrani, a soft-spoken, droopy-eyed man with an incipient paunch, is a BMW M nut. He knows everything there is to know about BMW’s M division. M, originally BMW Motorsport, started off in the early 1970s. It used to build and tune cars for the Munich-based BMW’s racing initiatives. Spurred by popular demand, M put wrenches into regular BMW models and modified powertrains, suspensions and transmissions. M-badged cars don’t look too different from normal BMWs, especially to a layman, but everything changes once you put pedal to metal. It is like activating some sort of ‘beast’ mode. About two months ago, we travelled with Nagrani to Portugal for the launch of the new BMW M3 (and the M4, the coupe version of the M3) and shared a car with him, as we drove to a test track, in Algarve. We were in a radiant blue M3, the sun was shining bright, and the car’s booming exhaust note seeped into the cabin. It was as good a time as any, we thought, to find out why M is such a cult. BMW’s M models are among the very few cars that impact men so viscerally. The new models we drove in Portugal are more politically correct and have a lesser number of cylinders than their predecessors, but they still pack an enormous punch. Thanks to a high tensile steel monocoque, aluminium hood and doors, and a carbon fibre roof, the new M3 is about 80 kg lighter than the model it replaces. It also possesses a 50:50 weight balance. But, as significantly, the engine that powers it – the last gen M3 had a massive 4.9-litre V8 under the hood – is now a 3-litre straight six with twin turbos that spews a staggering 424bhp and delivers incredible low-end shove. The dual-clutch automatic M-DCT gearbox is a willing and able partner to the car’s remarkable capability for acceleration. One hundred kph comes up in a sweet 4.1 seconds. 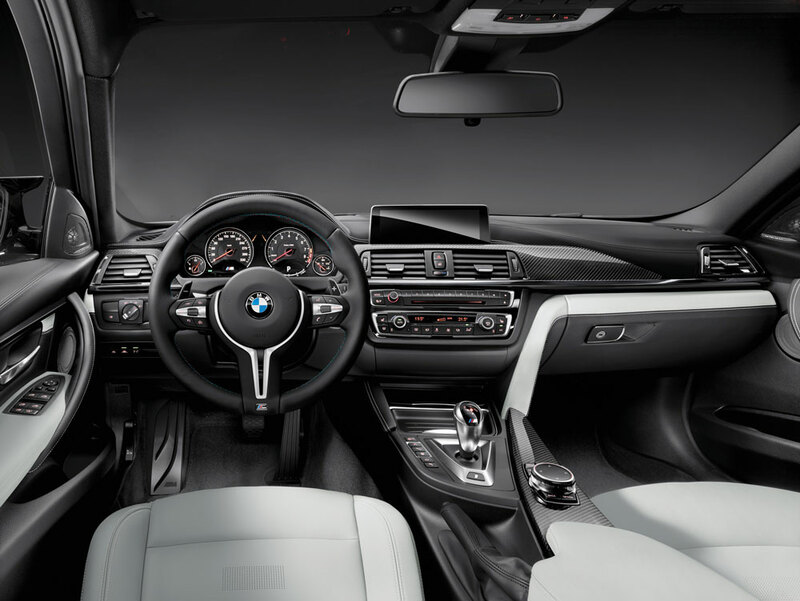 M’s Driver Performance Control, accessed via three buttons on the centre console, help you to change the character of the car. Drivers get to chose between Efficiency, Sport and Sport+ modes for throttle mapping, and Comfort, Sport and Sport+ modes for damping properties. Whether on the track or on the road, the M3 exhibited a delightful poise. It was sure-footed both around corners at the challenging Portimao track and while tackling undulating surfaces in rural Portugal. The ride was a lot less stiff than you’d expect from an M model, and the electrical steering is exceptionally accurate. “I just love the exhaust note on this one. They’ve really got it bang on,” said Nagrani, as he stabbed the throttle. And, he is right. Despite being two whole cylinders down on the engine that powered the last generation car, the M3 sounds gorgeous, and though most of it is created by some sort of electronic trickery, it sounds nearly as good as a V8 engine’s roar. The exhaust note, of course, is not the only aspect of the car that BMW has got right. When they set about building the new M3, which is expected to be launched in India later this year, they were faced with a host of challenges. But, what they’ve done is create a car that, while being a cautious child, stays true to the spirit of the original M.